What is the 4th axis? It is a rotational axis, labeled "R" on this unit. The syringe mount clamps to the cylinder that descends from the robot's head, allowing for 360 degrees of rotation. 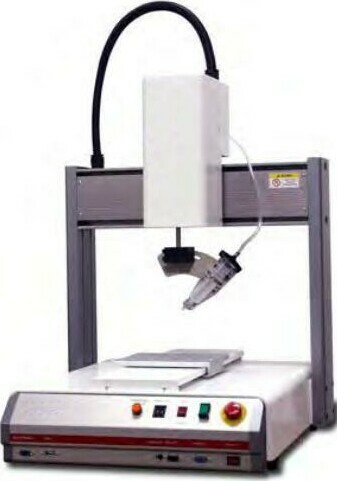 The 300MM Stepper is our most popular industrial robot with a dispensing area of 300MM X 300MM and a 100MM height. The rotation axis is perfect for flat screen manufacturing, gasketing, sealing enclosures or any application where the head needs to rotate to stay perpendicular to the part or stay aimed and dispense into the corners rather than alongside the wall of the part. ​Do you also want the angle of the dispense tip to change as well as rotate? You will need a 5 Axis Robot for that movement. These benchtop industrial robots are ideal for automating a current dispensing application. The IO inputs can be used to signal any system that uses an electric signal. If you are happy with your existing dispensing equipment then keep it. A program consists of a series of instructions stored in the main unit, each instruction stored in a numbered memory address. An address may record a point location, X, Y, and Z axis value, point type or instruction which sets a certain parameter, such as a dispensing time or line speed. Work Load: Table/Tool: 11 kg./6 kg. Includes the 5551104, 4 Axis Robot fitted fitted with a spray valve system designed for spraying flux, urethane, paint, lubricants, and for coating or marking applications. Includes the teach pendant, IO cable, valve controller and valve mount. Requires regulated compressed air, up to 100psi, to function. 115V or 230V power supply.